Why Sell Your House Through One Percent Realty? The real estate market in Nanaimo can be volitile and it takes an experienced professional to move your house quickly, professionally, and profitably. Contact me today for your free no oblicgation quote. Specializing in Nanaimo and surrounding areas..I have SOLD all of my listings in this HOT SELLERS MARKET!!! Professional Competent Service. Absolute honesty and integrity in business dealings. My undivided loyalty and commitment to helping clients meet their individual needs, guarantees the BEST RESULTS when selling or buying your home. You want full service on MLS® from a professional salesperson at a low commission – that's One Percent Realty. We provide you full real estate services at a discount commission rate of only $7,950 for all homes under $700,000. $3,500 of that $7,950 flat fee goes to the real estate agent that represents the Buyer. Houses over $700,000 are 1% + $950. We have full cooperation with other real estate agents who sell approximately three quarters of our MLS® listing sales. Our fully licensed sales professionals are members of their local MLS® real estate board enabling them to properly market your property both on REALTOR.CA and their local MLS® system for maximum exposure to potential Buyers. Our real estate agents provide the same real estate services they would if they charged you a higher real estate commission, the only difference is they charge you less, way less. It's the best deal in town, why pay more to sell your home? Scenario 1 - Sell it through One Percent Realty. We will charge you $7950 for this same $500,000 home, with all the services and exposure that you would receive from the traditional higher commission companies. This fee also includes payment to the buyers agent (usually $3500). We do open houses, handle the showings, negotiations, and paperwork that you would expect from any full service real estate company. In short, the services and exposure are the same as you would get from option #1 above, but for way less money. Scenario 2 - Sell it yourself. You can now put your home with a local real estate board that operates an MLS® system and have your home exposed with all the other listings, and deal directly with the public or salespeople who may show your property. Worth noting, is that since your property is on the local board MLS® system you will have a reasonable chance of dealing with a buyer's agent. These buyers agents expect to be paid. Most likely, they will be looking to the Seller to pay them something, probably at least half of the fees discussed above (the $500,000 home). So again, if we use the $500,000 home as our example, a buyer's agent in British Columbia often will be expecting to receive approximately 3.255% on the 1st $100,000 plus 1.1625% on the balance of the sale price or $7,905 to sell your property plus an additional $500 or so for the FSBO company's upfront listing fee ~totalling $8405. Scenario 3 - Sell it through the traditional "higher commission companies" who will place your property with a local real estate board that operates an MLS® system and provide full service real estate. Depending upon what your home is worth, this will cost a fair amount of money, though it will vary across the country. 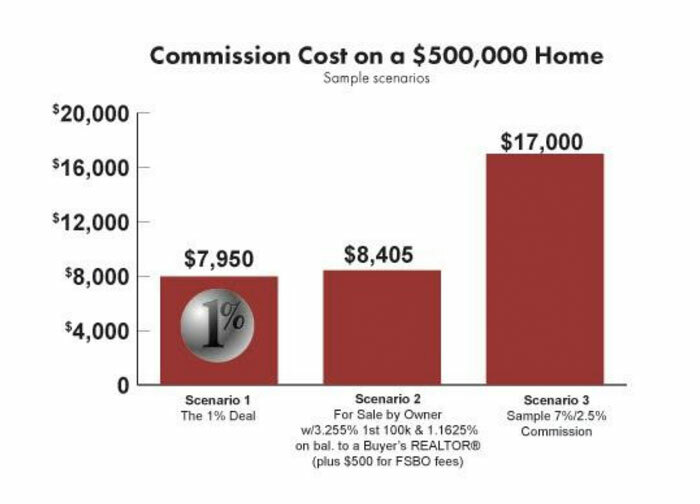 A $500,000 home can typically cost $17,000 (assuming a 7% commission on the 1st $100,000 and 2.5% on the balance) in British Columbia through a company like this, although commissions do vary in the marketplace. So if you can have the full services of our professional salespeople for only $7950, why would you not just leave it to a professional? It has no relationship with the amount of commission you pay. With extensive experience in project marketing, we realized that there may be an opportunity to market houses in a similar lower commission higher volume manner. Spending most of their time prospecting for business, the conventional agent requires a higher commission structure to compensate for the lower volume/lower listing success rate in the highly competitive real estate industry. With the help of the technological advances such as the Internet, cell phones and fax machines, One Percent Realty was able to reduce the typical real estate office overhead as well as leverage the productivity advances of its agents to create a successful discount commission business model. Whereby our agents earn less per house sold they make it up in volume of sales at the end of year. It works great for us, and it works great for our Sellers. We say at One Percent Realty, the more deals we do the more money we are saving our clients! The simple answer is yes. Our MLS® listings are shown, and sold, by lots of Cooperating REALTORS® all of the time. Logic would dictate that if our system was unable to attract Cooperating REALTORS® to sell our MLS® listings then we would be selling most of our own listings to our own Buyers. In fact, its quite the opposite. Over 80% of our listing sales are sold by Cooperating REALTORS® representing the Buyer which is inline with industry standards. That is the proof in the pudding that our system works great. Why is that. We believe it is two reasons. Firstly, our listings (under $700,000) typically offer $3500 commission to Cooperating Brokers. While $3500 might not be as much as some of other listings, it still is a decent amount of money for a paycheque for Canadians these days including a lot of sales professionals. The more important reason why other agents cooperate and sell our listings is that it is the Buyers who are dictating the shots these days. As mentioned above, if the Buyer loves the home does the amount of commission matter to the Buyer? Specializing in Nanaimo, Lanztville, Nanoose, Parksville & Ladysmith areas. Professional, Dedicated, Full Service Realtor® Full MLS® advertising. My commitment to you is to make buying and selling your home a comfortable, enjoyable and most importantly an inexpensive experience. I have lived here for over 26 years. I understand the different communities well and having several family and friends in the business gives me a great network of people in the know. For a free evaluations or questions that you might have please do not hesitate to contact me. Call Donna today! I also understand the reason so many people are draw to beautiful Vancouver Island. I moved here from Vancouver 26 yrs. ago and I am proud to say I am happy we made the move. One Percent Realty will provide you with the same level of service and exposure you need without the costs associated with a full commission listing, saving you thousands of dollars in fees. 1 Billion dollars of real estate in 2012. I bring to you a high level of commitment, integrity and expertise, and will diligently work with you in meeting all your real estate goals. I am very familiar with the neighborhoods and school districts throughout Nanaimo and the surrounding areas, having lived and worked in mid-Vancouver Island for 24 years. Moving from Vancouver to beautiful Vancouver Island was a welcome change of lifestyle. Island time! Quick Fix - Eliminate Minor Problems on Inspection Reports. Vacuum out bathroom fans (monthly). Change filter in furnace and vacuum it out (monthly in winter months). Clean gas fireplaces and vacuum out underneath unit to eliminate dust and spider webs. Repair and or replace caulking around tubs, sinks, showers and backsplashes. Ensure dryer vents are metal flex (not plastic flex) heat rated for dryers. Inspect and replace weather stripping where needed. Optional -Ensure GFCI outlets are installed outdoors and in bathrooms and kitchens and test to ensure they are in good working order. Ensure downspout leaders are attached and directing water at least 6 feet away from foundation. Ensure all light switches and receptacles have proper cover plates installed. Clean leaves and other debris out of all gutters. Move anything blocking access to areas like the attic, electrical panel, furnace, crawl space and main water shut off. I have buyers looking for particular properties.